James Ramsden is a high achiever. 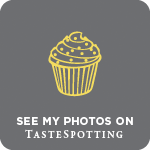 Trained at Ballymaloe cookery school in Ireland, he started blogging back in 2008 and has since carved himself a career as a respected food writer for The Guardian, The Times, Sainsbury’s magazine and more. Not content with writing for broadsheets, magazines and maintaining a successful blog, he also runs a popular supper club from his home in North London and has just published his first book. All at the tender age of 24. That’s two years younger than me. By rights I should be green with envy. But I’m not. There’s something extremely likeable about James and his attitude to food. He wants cooking to be simple and he wants it to be enjoyable. He appreciates the fact that, for most people, eating isn’t necessarily an endless succession of dinner-party-standard meals – that in any given week we’ll fluctuate between feeding large groups of friends and throwing together a solitary supper. His attitude reminds me of a cross between a younger Jamie Oliver (minus the cheeky chappy vocab) and my own boyfriend (like James, Carniverous Boyfriend is a Yorkshire boy). Maybe it’s an age thing. Maybe it’s a boy thing. But I definitely feel like there’s a lot I can learn from his enthusiastic, experimental, laid-back approach to cooking. Food should be fun. Small Adventures in Cooking, James’ first book, is exactly that – an exuberant foray into the kitchen suitable for cooks of any ability. Delving into the pages is a bit like discovering a magical world at the back of your wardrobe; James helps you turn cooking into a journey of discovery, encouraging experimentation with new cuts of meat, different spices and even ingredient substitution suggestions for his own recipes. The book is divided into eight chapters, from Morning Missions to Formal Forays, with sections dedicated to cheap cuts, mastering stumbling blocks like soufflés and mayonnaise, and even one entitled Corner Shop Capers for when the supermarket just isn’t an option. From hearty veal shank and pork belly to elderflower ice cream, the flavours are big and interesting without feeling daunting. I have to admit I shuddered slightly at the corner shop recipe for pitta pizza with tinned fried onion but I can definitely see Carniverous Boyfriend wolfing it down after a late night beer or three. As I said, maybe it’s a boy thing. Small Adventures… is part of Quadrille’s ‘New Voices in Food’ venture. Recently there’s been a lot of discussion of the growing influence of bloggers, with a number of the most influential ones breaking into the mainstream with book deals over the last year or so. I’m not going to delve into the debate too much here as it could be a whole separate article, but suffice to say I think what Quadrille are doing is very exciting. Yes I could access a number of James’ recipes from his blog without buying the book, but I like the fact that this specific selection has been made and presented to me within its pages, accompanied by pictures, tips and tricks over which I can spill crumbs and splatter sauces. I guess only sales figures will tell, but I have a feeling that in a few years James could be a cookbook-shelf staple alongside the likes of Nigel Slater. In a slightly self-conscious nod to the blog from which it developed, every attempt has been made in the book to combat our growing obsession with the internet and diminishing attention spans. Each recipe is followed by options to ‘tart’ and ‘tweak’, allowing the reader to make that extra little effort or substitute ingredients. Recipes are also followed by a hashtag, the idea being that people can go on Twitter and share their recipe successes and casualties with other readers. It’s early days in the book’s shelf life so only time will tell how successful this feature will be, but it’s a fun idea which fits well with James’ ethos of sharing, discussing and enjoying food and the debate that comes with it. I hope it works. When picking a recipe to cook for this review, I wanted something which would showcase the principles behind James’ cooking. 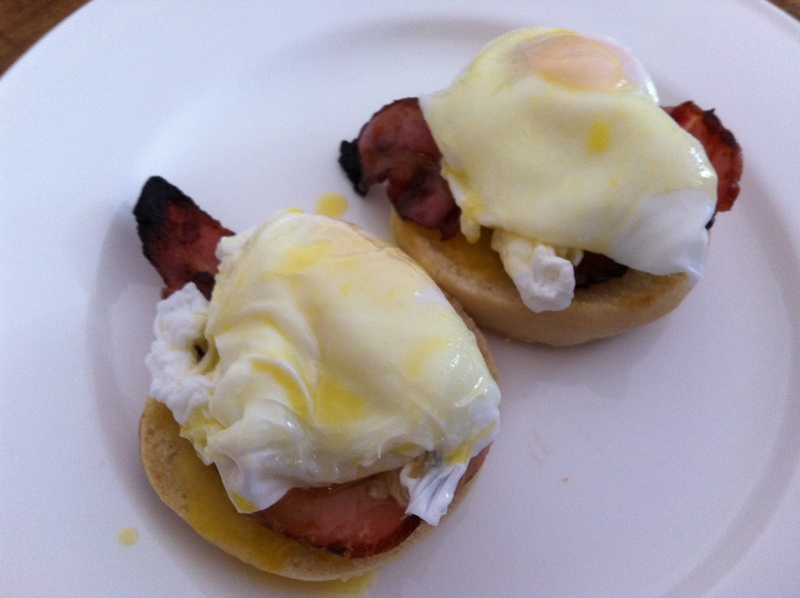 Pork wellington, duck rillettes, beef chilli tacos and grilled sea bream all cried out to be cooked, alongside pages of fruity, spiced puddings, compotes and ice creams, but in the end I opted for something beautifully basic, Eggs Benedict. It’s the kind of dish we order all the time for brunch, but how often do you sit back and bother to make your own muffins, whisk together a foamy hollandaise or poach the perfect egg? This is the kind of cooking that James does best. Every day, delicious and simple, but challenging you to try new techniques and think outside your comfort zone. 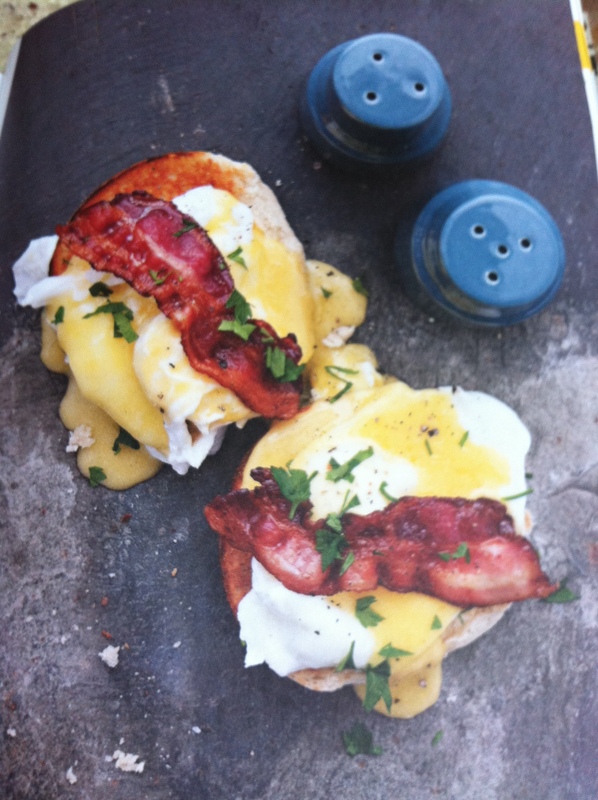 I’m happiest when baking and rattled out the muffins with ease, but pulling off a hollandaise sauce whilst poaching eggs, grilling bacon and generally waking up to the morning world? I needed James to hold my hand. In the end the sauce turned out a little bit thin, but otherwise the dish was perfect. And it was just my first attempt. As James says in one of his handy end-of-chapter hints, cooking is a process, a learning curve to be enjoyed, but in which we sometimes make mistakes; ‘of course it’s frustrating when something you’ve spent time on misfires. But really, the best thing to do is laugh and get on with it. Eat some toast. Drink more wine. Ultimately, this is just food’. My review in three words? 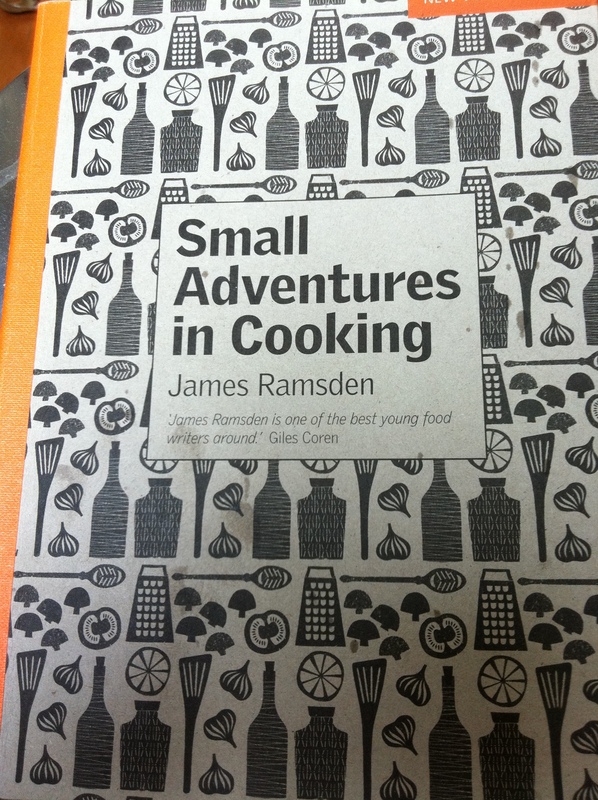 Make food fun (or perhaps, Buy this book). Many thanks to Quadrille for sending me a copy to review. Gently warm the milk then remove from the heat and add the yeast. Leave to sit for 10 mins while the yeast wakes up. Weigh the flour, salt and sugar into a largebowl then add the milk and bring together to a sticky dough. Turn onto a clean work surface and knead about 10 mins until smooth and elastic. Return to the clean bowl, flour and wrap in a black plastic bin bag. Leave to rise until doubled in size, about one hour. Turn the risen dough onto a clean work surface and knead briefly. 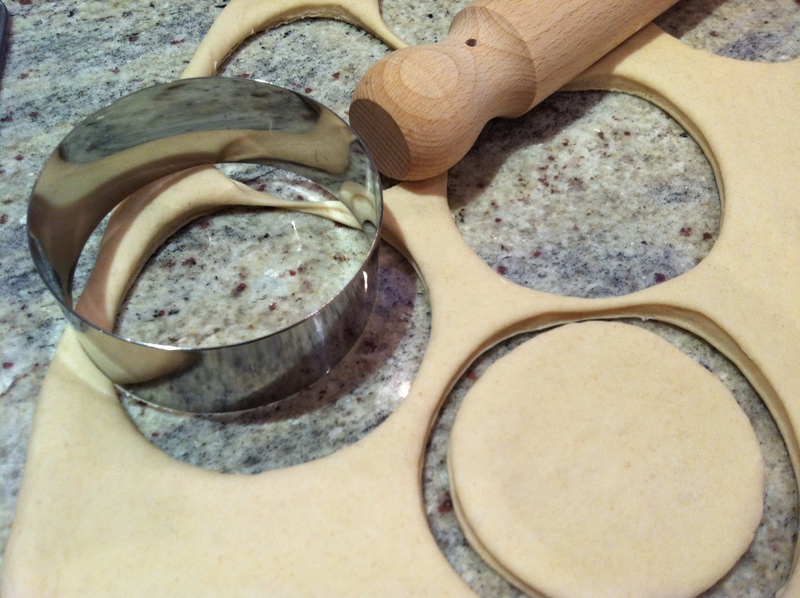 Roll out approx 1/2cm thick and cut large rounds using a cutter (the end of a glass or mug will do). Put on a flowered baking tray, wrap in the plastic bag and leave to rise around 30mins until nicely puffed up. Grease a frying pan with a little butter, place over a medium heat and cook for approx. 7 mins each side until golden and irresistible. james sounds like my type of guy! 🙂 dish looks fabulous! Thanks. Next time I’m hoping my version will look as good as his! It is a little known fact that Yorkshiremen make the best chefs! If they were your home made muffins you should be on TV. They are so perfect. 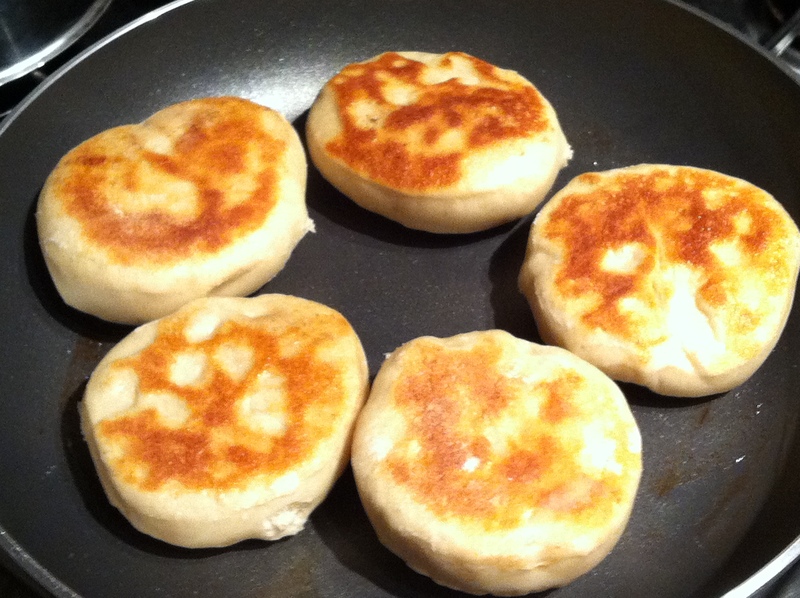 I wondered if you’ve ever tried your hand at English Crumpets? 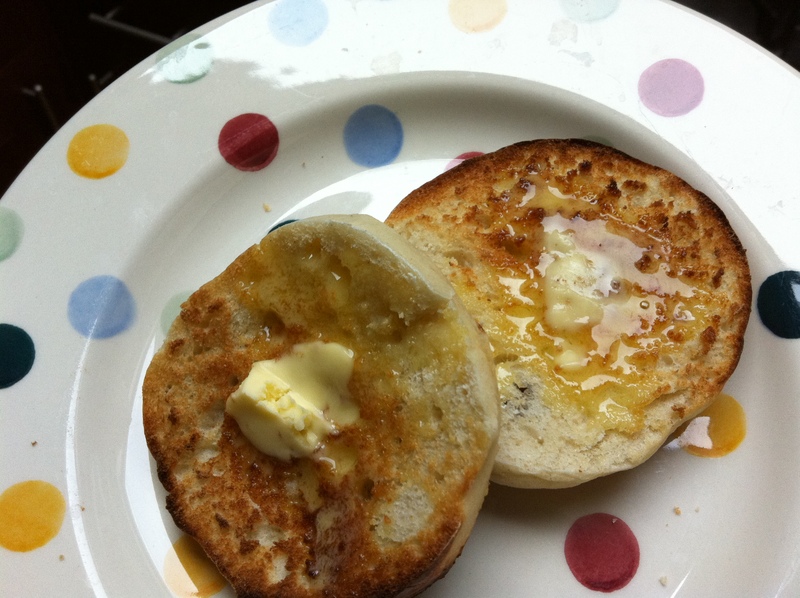 There’s nothing better than a freshly cooked crumpet smothered in butter and jam.